Beyond the Rack carries much more than just fashion; they have housewares, jewelry, beauty products, accessories and more. Given the funds, I could really go wild on their site! How it works: Items are listed into event's and each event only lasts for a couple of days. They carry high-end and designer brands and everything is deeply discounted. I was really happy when my order came. It was obvious that the items were of high quality! 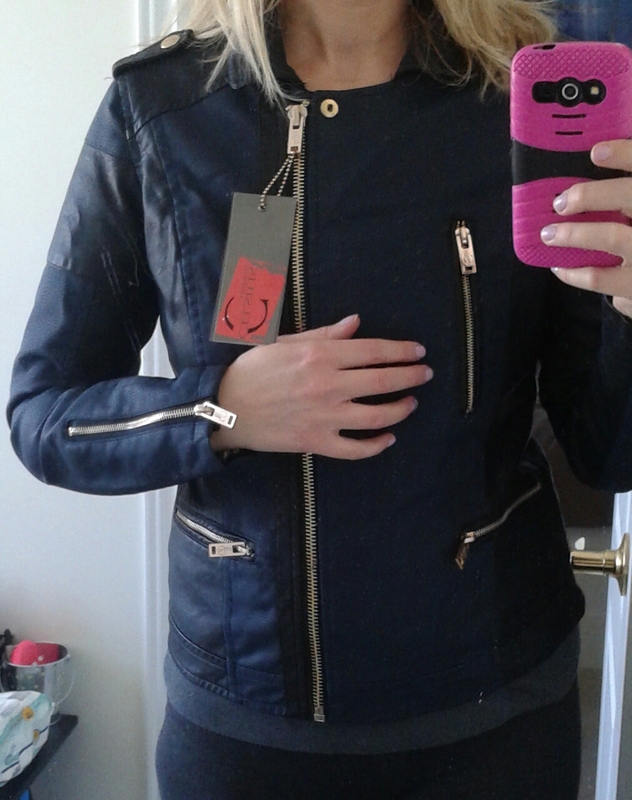 The first item I ordered is this gorgeous blue and black pleather moto jacket with gold detailing. The brand is Celsius and it's called The Kelly Jacket. It was only $34.99 but retails for $135! I love how this piece can be dressed up worn over a maxi dress or dressed down worn over jeans or leggings! 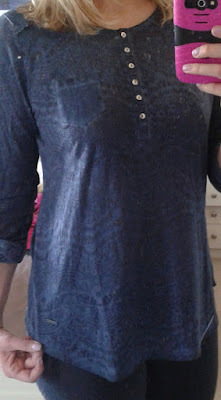 The second item I ordered was this gorgeous Henley top by Triple Five Soul called the Shawna top. It's sheer with lace-like detailing and has that worn-in look that I love. The sleeves can be rolled up and buttoned with the attached tabs or worn down. This was also $34.99 regular price was approx. $105! ( I say approximate as these events are over so I cannot find them on the site at this time and they don't have the price on the manufacturer's tag). 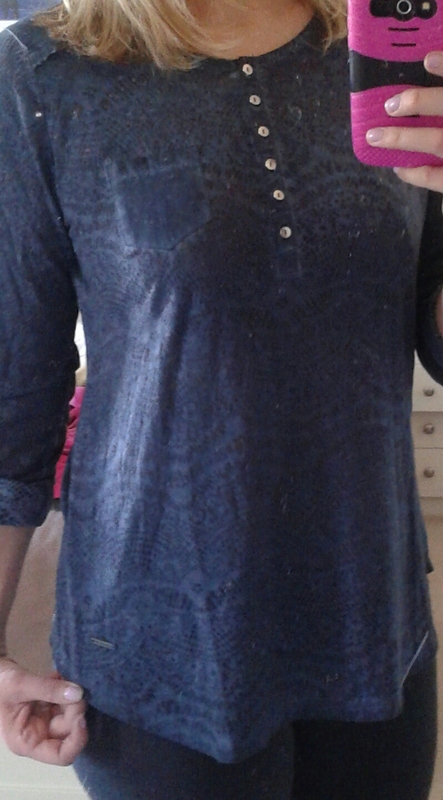 I love this top, it's so comfy and it covers my tush which I love! I don't find that often as I'm 5.75"
It has a lot of nice detailing including a pocket, shoulder patches, worn/distressed look etc. 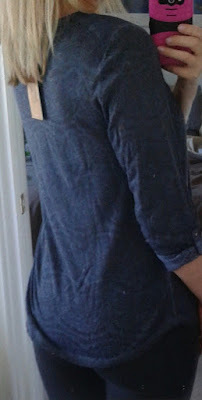 All the little details in this top take it from a regular Henley style top to a simple but super fashionable piece. My third and final item in this haul are these gorgeous black ankle booties by Alexis Harrison. 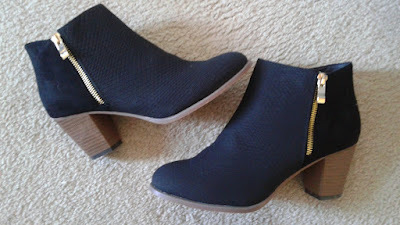 They are called the Nicole Croc & Suede Wood Heel Booties. They have a snake embossed pattern on them and I love the gold zipper detail. They have a modest heel at just under 3", so they are comfortable to walk in. These were priced at only $29.99 and the regular price was approx. $150! I'm so happy to have a pair of ankle booties that I can wear socks with. I never wear my other ankle boots as they have cutouts in them, so I can't wear socks with them. So that's my little haul. I'm really happy with my purchases! I hope you enjoyed seeing what I purchased. I know I'm going to get a lot of wear out of all of these items and that is money well spent! Shipping was only $7.99 and that got me 3 days of free shipping! I know they often have free shipping promos too. I love that Beyond The Rack's website is constantly getting new stock and opening new events. I love to browse around and see what new things come in. If you like to hunt around for bargains like I do you will love this site! Tip: When shopping around on their site, I found it really helpful that they have drop down tabs at the top of the pages to narrow your search eg. by size, price etc.. Beyond the Rack is a private shopping club for people who want designer brand apparel and accessories at up to 80% off MSRP. We offer authentic designer merchandise exclusively to our members through limited-time events. Each event starts at a specific time (9:00AM ET and 5:00 PM ET) and typically lasts 48 hours, except for events that start on Friday, which last until the following Monday. After each event ends, the merchandise is no longer available. Note: they ship only within North America. I definitely recommend Beyond the Rack. to anyone who likes getting great deals on good quality merchandise and designer brands. It's a great spot for finding gifts as well, I saw some gorgeous men's watches! Know any great places to shop? I love shopping, so please leave your recommendations in the comments! That jacket & the boots are HOT! 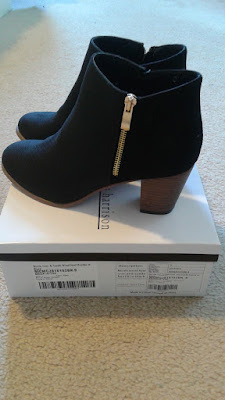 I'll be looking for a pair of heeled ankle boots/booties this upcoming Aussie winter, but given my large & wide feet it'll be a bit of a struggle sadly.